Do you talk to things that can’t talk back? I talk to my dogs, my plants, my car, and lots of things that can’t talk back. It’s anthropomorphizing—a big word that means attaching human traits, emotions, or intentions to non-human entities. Why and how humans have this ability can’t be fully explained because our brains are so very complicated. Finding human characteristics in inanimate objects signals the brain’s creativity at work. Anthropomorphizing is also part of our nature. We are social animals. We want to befriend everyone we meet, give them a name, or have them give us their name, and talk to them. If you saw the movie Castaway, Tom Hanks’ beloved best friend was Wilson, a volleyball with a face. If you haven’t seen it, you should. It’s a great film. Around my house, my vacuum cleaner is Ugh-glow, my canning strainer Shirley, and the metal art dragon in my yard is Custard. My houseplants have names too and sometimes they even perk up with a pep talk. 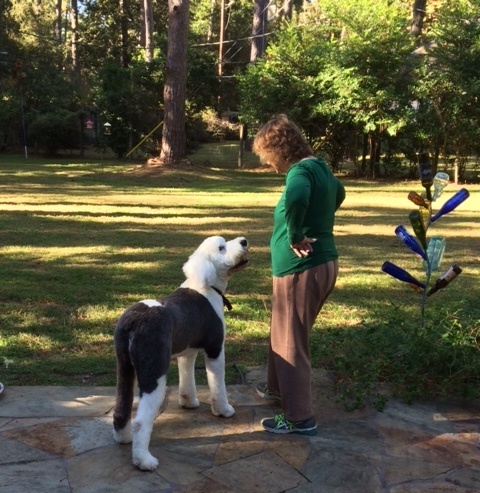 My Old English sheepdog Finnegan MacCool and I communicate well. So does his older brother, our Maltese Buster. I ask them if they’re hungry as I pour the food into their bowls or if they want to go play outside. I tell them to keep the giraffes away from the house when I leave and say “I’ll be back soon” as I walk out the door. Fellow pet owners will relate. Others think I’ve gone cuckoo. That’s okay. I take comfort in Epley’s words. Anthropomorphizing is superior intellect and creativity showing forth. Do you have any inanimate friends you have anthropomorphized? I believe your dogs do talk back. It might be you are the only one who hears them. Your geraniums do hear you, but are just being contrary. I don’t know about the strainer. I’ve never met one.